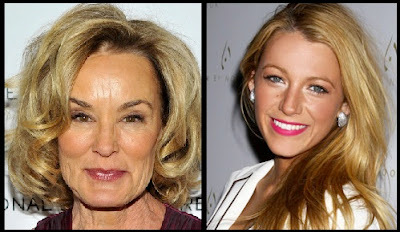 XOXO Jes - Canadian Entertainment News: Blake Lively and Jessica Lange to film in Calgary? Blake Lively and Jessica Lange to film in Calgary? Blake Lively and Jessica Lange may be filming a movie for HBO in Vancouver and Calgary in the Fall. Sources tell me that there were some people in town this week scouting out locations in the Calgary parks and mansions around town. No idea what the movie is about or who plays what...but clearly someone is rich. I will keep my ears open for news in the upcoming months if this is actually going down. As we know, nothing is certain in the film world..but if Jessica Lange comes to Calgary I will be pretty jazzed. And, I mean...if Blake is here there is a chance for me to attack Ryan Reynolds, so that is always thrilling.